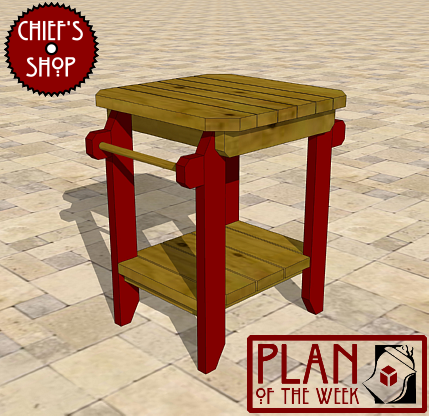 The Chief’s Shop Grill Side Table was one of the more popular Sketch of the Day concepts from 2013. Use it next to your grill as a table for prepping or staging food. The handles can be used to place towels or grilling tools. Lumber required includes a 2x2 some 2x4s and 2x6s and a 1-inch round dowel. Overall dimensions: 26 1/4 inches wide x 25 5/8 inches deep (30 5/8 inches at the handle) x 33 1/2 inches high. You’ll need a miter saw or circular saw, drill driver, and Kreg Jig to build it. After purchasing the plan, you will be directed to a download page.